Cay Bang Restaurant is the well known place for enjoying seafood in Phan Thiet. It was established in 1990 with the small scale. For years, this place has become crowded more and more. Till this time. 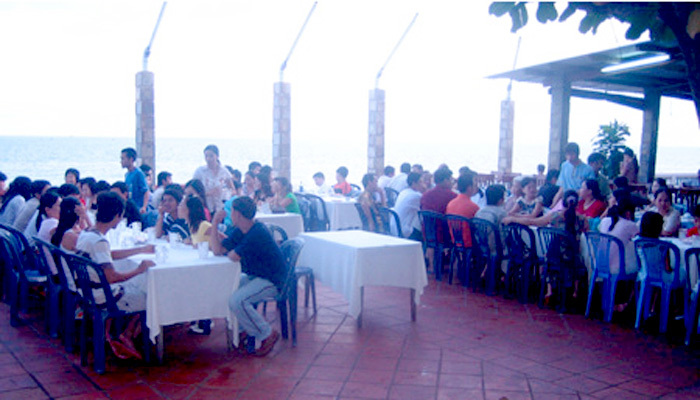 The restaurant is considered one of the most crowded restaurants in Mui Ne Ward. The restaurant is the reliable destination for seafood in Phan Thiet. Many tourists who have the beach holidays in Mui Ne Beach loved to come to Cay Bang Restaurant for their dinner with the pleasure. Cay Bang Restaurant now is in more than 2000m2 in square. It is larger than before so much in scale. This shows the evident to the development and facilitation of the restaurant for years. There are more than 1000 seats which are able to be set in the same time. And there are 4 different sectors where serve guests with specific requirements. Beside, the restaurant is located in the ideal place for convenience also the great view. This is one more the reason that makes many people love to come to enjoy their food. Cay Bang Restaurant focuses on seafood mainly. From the beginning this place has been famous of fresh seafood. The dishes are so tasty even the simplest dish such as seafood noodle. For years the typical taste is not changed. The fresh food here is always in the standard that makes you to be pleased. You can find in Cay Bang Restaurant the rich seafood with different types in different cooking ways. The restaurant serves lobsters, shrimps, squids, sea crabs, snails, groupers, oysters, sting ray fishes, etc. There are the typical delicious dishes here such as seafood noodle, fish raw salad, lobster with wasabi, Oyster wasabi, grilled oyster with cheese, fried eggs with oyster, oyster porridge, etc. The price for food in Cay Bang Restaurant is in the medium level. It is not so expensive and it is not cheap compared with other restaurants in the same area in Phan Thiet. Most of guests return here for their dinner or lunch if they have more times to come to Phan Thiet. Food, the price and view make them pleased in each time of coming back.